Download HP Officejet 6310 Driver for Windows, Mac OS X, and Linux below this product description. In addition, HP Officejet 6310 Driver equipped with Photosmart Essential software which it make you easy print your documents and photos. The HP 6310 also delivers high-quality Ink Cartridge such as HP 98 Black Inkjet Cartridge, HP 95 Tri-Color Inkjet Cartridge. 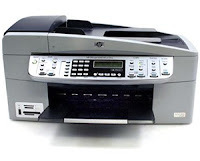 Plus, HP Officejet 6310 All-in-One is suitable for all your home or office document and photo printing needs. HP Officejet 6310 offers print, fax, scan, and copy all in one device from one location. In addition, you'll get laser-quality text and true-to-life photos in six-ink color. Plus, print speed up to 25 ppm (black), and up to 20 ppm (color), it also offers copy speed at up to 30 ppm in black and 24 ppm in color. HP Officejet 6310 ensure you transfer and print fast with the Hi-Speed USB 2.0 connection, and also from a memory card without turning on your computer. In addition, it also equipped with Ethernet LAN port, PictBridge, LCD text display, but no optional wireless connectivity.